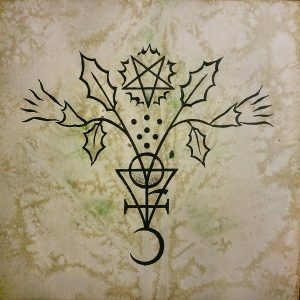 The ‘mullein’ sigil is a newer work in the “Sigilla Magica” series and has already become a popular motif among my plant inspired sigils. It was available for the first time during the Samhain Celebration 2017, in Gotha. The illustration is an anthropomorphic vision of the lovely mullein (Verbascum spp. ), which is also known as hag’s taper, aaron’s rod and Königskerze in German. 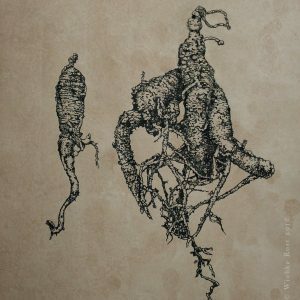 In the sigil I summarize folklore and personal experiences related to this powerful magical plant. It contains links to the Venusian, Saturnian and martial aspects of the plant, as well as to the many names by which it is known. It also plays with the plant’s form of growth. 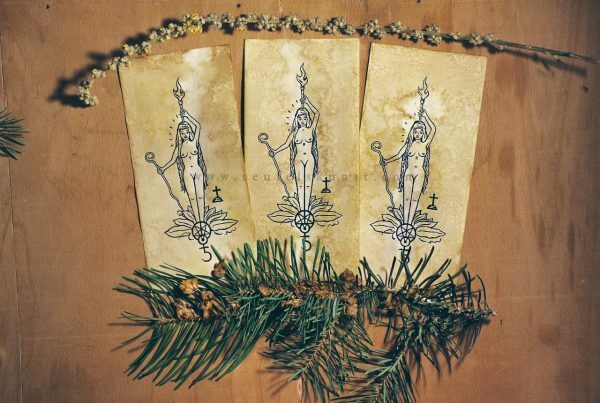 You can now purchase an original ensouled paper talisman with the sigil. 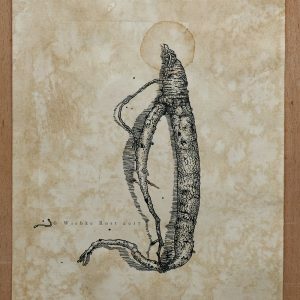 The motif is drawn with black India ink on coffee stained paper, which has been infused with tinctures of mullein, wormwood and honey. Each paper sigil is signed and dated on the back – this being the Winter Solstice edition 2017. The entire talisman measures ca. 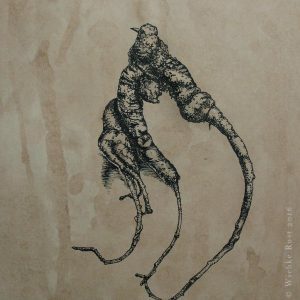 9,9 x 21 cm. You receive one of the original works shown here. There are 3 available at the time. Please note, that each paper talisman is unique and whilst the motif is the same, can have slight variations and differences in texture. The yellow color comes from the mullein’s own flowers. The color may change if exposed to sun light. Winter Solstice Edition 2017 – comes including incense sample – 3 available. Wunderschön, sehr kräftig und ausdrucksstark. Das Wesen der Königskerze kommt sehr gut durch!